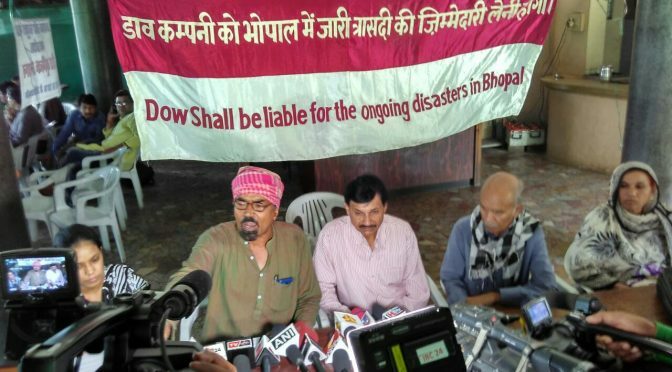 At a press conference today, leaders of five organisations of survivors of the Union Carbide disaster in Bhopal charged the directors of Dow Chemical and DuPont with unlawfully withholding information from their shareholders on the liabilities of Bhopal. They said that shareholders of both the corporations will be voting on the proposal of merger between the two companies today. “Legally, company directors are duty bound to disclose all facts that are material to the stockholders’ consideration of a transaction. 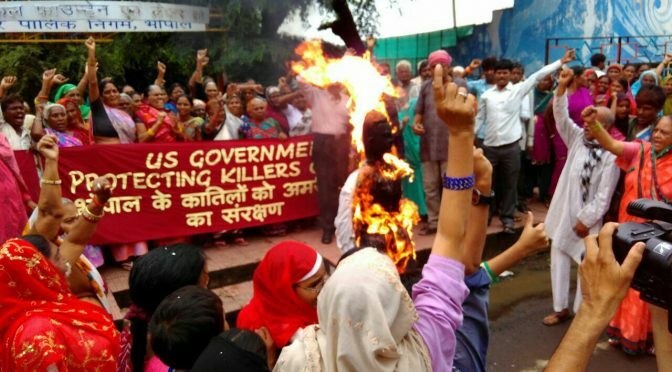 But DuPont shareholders have been kept in the dark about the criminal, civil and environmental liabilities of the Bhopal disaster that Dow Chemical has inherited through taking over Union Carbide.” said Rashida Bee, President of the Bhopal Gas Peedit Mahila Stationary Karmchari Sangh. Nawab Khan of Bhopal Gas Peedit Mahila Purush Sangharsh Morcha said that shareholders of Dow Chemical had not been informed of the liabilities of Union Carbide that they inherited. “As a consequence of its merger with Union Carbide, between 2008 and 2016 Dow Chemical has suffered business losses estimated at 300 million dollars in India and has failed to invest 5 billion dollars by 2015 as it had planned.” he said. The organizations reported that their American supporters will be holding demonstrations outside the shareholders meeting at Dow Chemical. 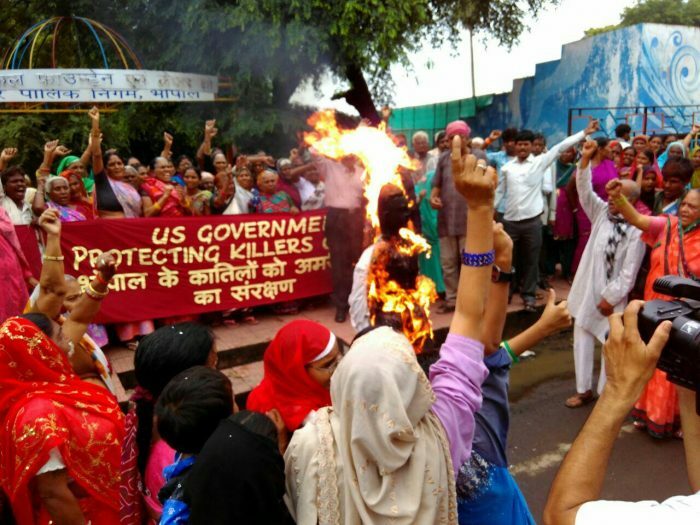 “Our supporters will also be raising questions regarding Dow’s Bhopal disaster related liabilities inside the shareholders’ meeting at Midland, Michigan today” said Rachna Dhingra of the Bhopal Group for Information and Action. Safreen Khan of Children Against Dow Carbide expressed hope that the US Securities & Exchange Commission would take note of the illegalities in the Dow – DuPont merger and deny approval for the same. 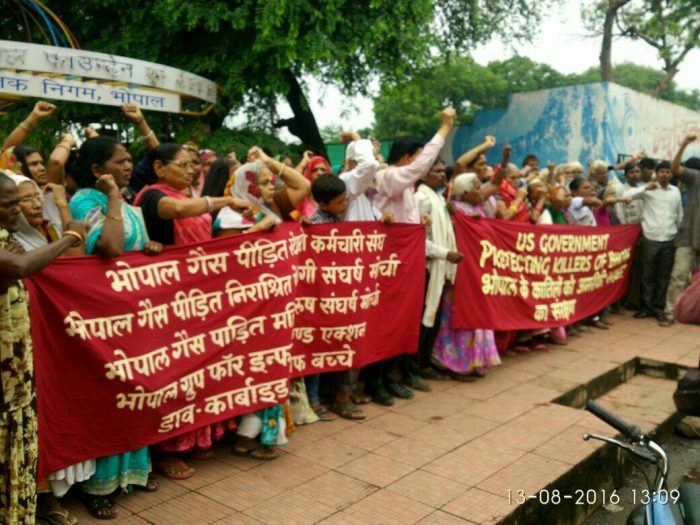 Leaders of all the organisations of survivors of the Union Carbide Disaster in Bhopal today condemned the governments of both India and USA for the non appearance of any representative of Dow Chemical Company in the ongoing criminal case on the disaster. 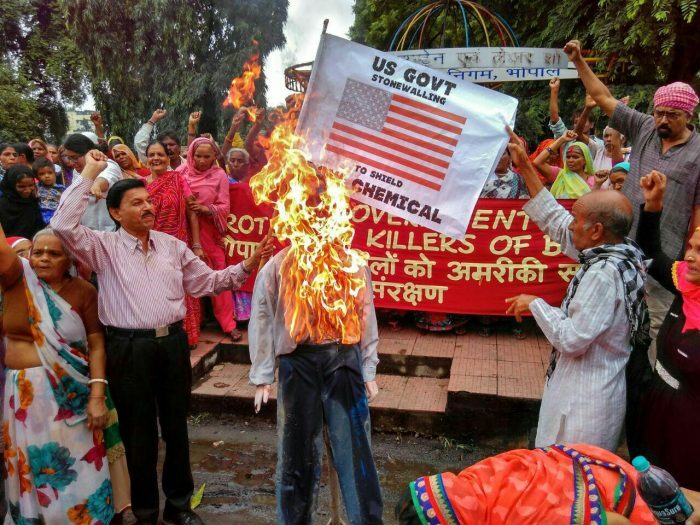 At the hearing in the District Court, counsel for Bhopal Group for Information & Action (BGIA), a local NGO assisting the Prosecution sought ex – parte trial proceedings against the American company before the judicial magistrate hearing the matter. “The Indian Criminal Procedure Code expressly provides for ex-parte proceedings against a defendant in a criminal trial that ignores notices of the court.” said Avi Singh a lawyer in Delhi High Court volunteering his services for the Bhopal justice campaign. In court Mr. Singh pointed out that Dow Chemical has publicly admitted their knowledge of the four consecutive notices issued by the Bhopal Court and it is evident on the corporate website. He expressed hope that the Judicial Magistrate who heard the NGO’s application would direct harsher measures against Dow Chemical at the next hearing scheduled for August 6, 2016. 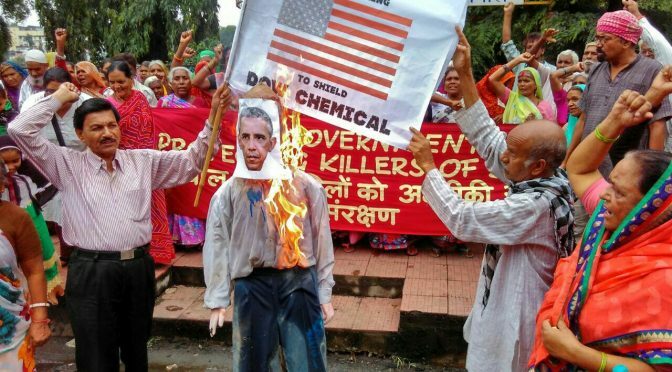 “In the last two years Dow Chemical has thrice ignored the court’s notice and all that the Indian government has done is send one meek request after another and not utter a word on the violation of the Mutual Legal Assistance Treaty by the US Department of Justice (DoJ) in not serving the notice on Dow Chemical” said Rachna Dhingra of BGIA. It was submitted that the CBI is deliberately shielding the Accused. 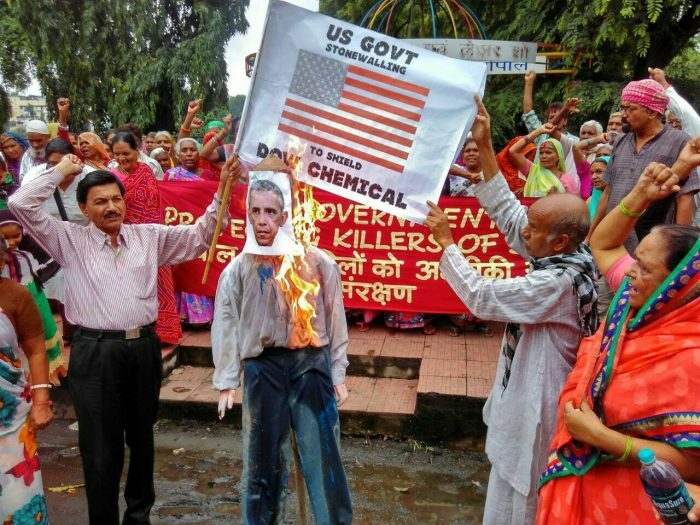 Bhopal survivors’ organisations had collected over one hundred thousand signatures on a petition demanding that the US DoJ serve Bhopal Court’s notice on Dow Chemical as per the terms of the Mutual Legal Assistance Treaty signed between India and USA in 1991. 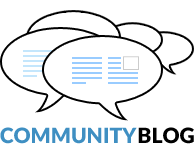 As per the terms of the petition on Whitehouse.gov website the US government is obligated to respond to charges of violation of MLAT by the US DoJ. The five survivors organisations: Bhopal Gas Peedit Mahila Stationery Karmchari Sangh, Bhopal Gas Peedit Mahila Purush Sangharsh Morcha, Bhopal Gas Peedit Nirashrit Pensionbhogi Sangharsh Morcha, Bhopal Group for Information and Action and Children Against Dow Carbide had sought the Prime Minister’s directions to the CBI, an agency directly under him, to seek harsher measures against Dow Chemical for its utter contempt of the law of India where it carries out business through at least five subsidiaries and joint ventures. Further, BGIA sought start of trial proceeding in the underlying criminal cases, in suspended animation for a quarter of a century, asserting that if UCC/Dow chose not to participate, the Court may proceed ex parte on the basis of the evidence already adduced in the case against the Indian accused.